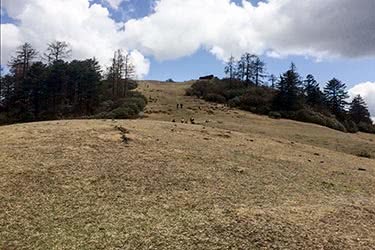 This unforgettable journey allows you to combine luxury travel with trekking, in an easy-to-moderate trek itinerary that showcases Bhutan's inherent rural charms. 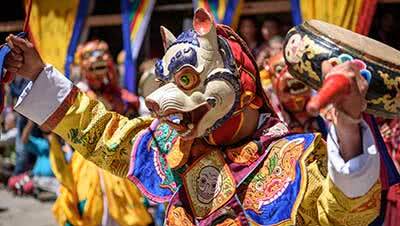 The western and central regions of Bhutan form the country's cultural heartland, and is where Buddhism first got its foothold. 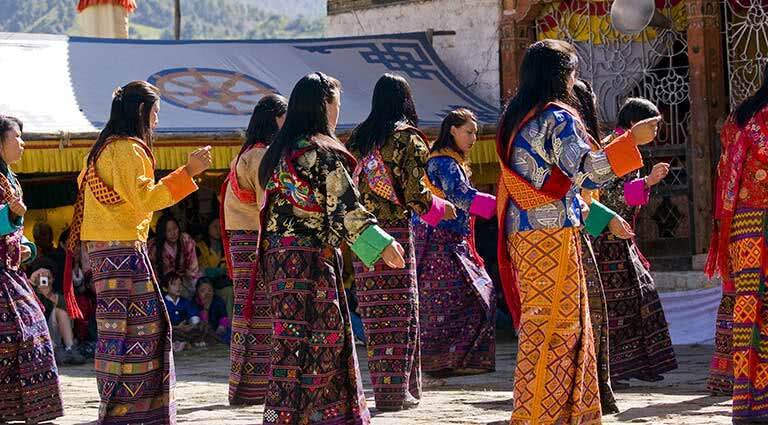 During this trip, you’ll travel from sacred sites in Paro to Bumthang, through the capital of Thimphu and the imposing settlement of Trongsa, with the opportunity to join one of Bhutan's many Buddhist festivals along the way. Arrive in the beautiful village of Paro, nestled in between soaring mountain peaks and alpine forest. 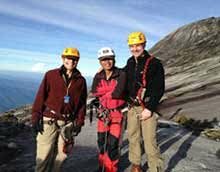 Spend time enjoying the fresh mountain air and acclimatizing to the altitude in preparation for your onward journey. Enjoy a night of luxury in your spacious suite at Amankora Paro. 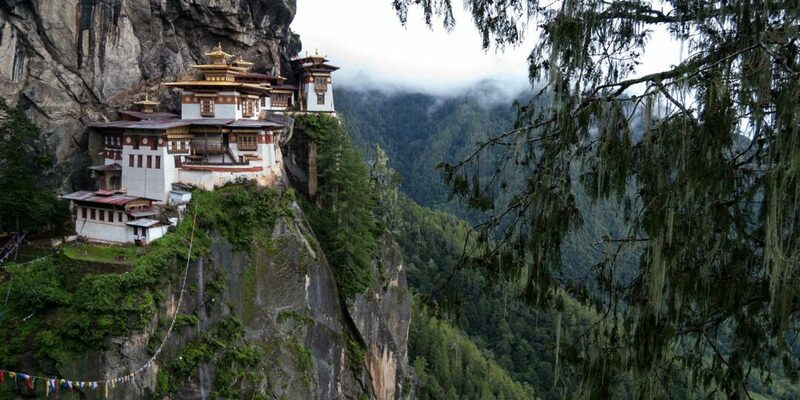 Today you will hike towards the Tiger’s Nest monastery - the famous Taktsang Temple. 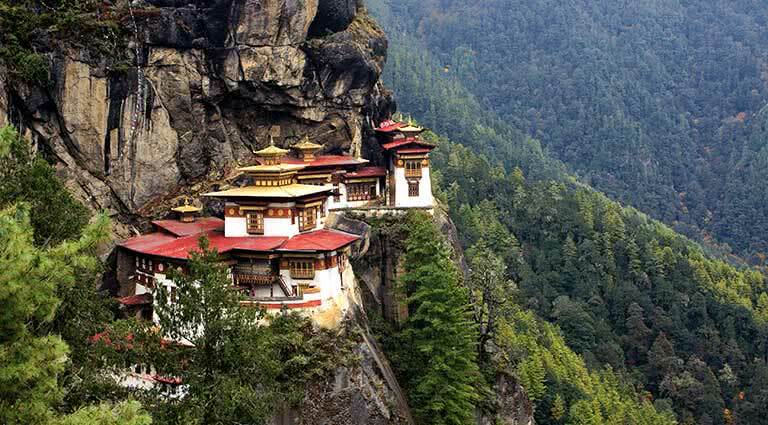 This is one of Bhutan’s most treasured and visited sites, clinging to the cliff face above Paro Valley, more than 10,000 feet above sea level. 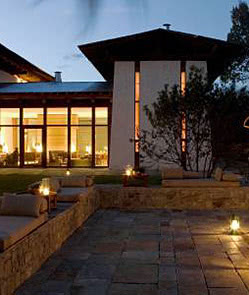 Spend the night in Paro at the Amankora - perhaps book a massage at the luxury spa there. 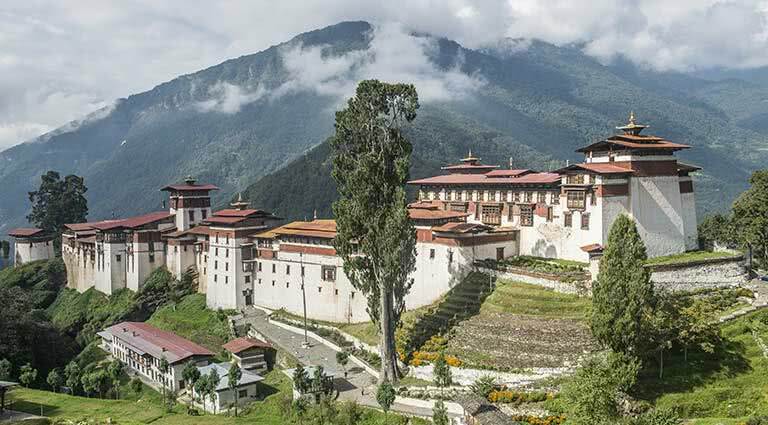 It’s time for a cultural excursion today, as you visit Bhutan’s National Museum - the Ta Dzong Museum in Paro. 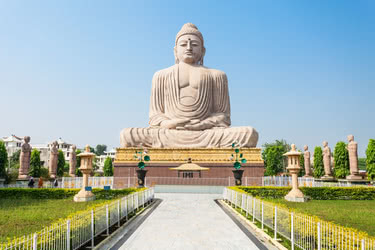 You have the option today to hike to the 14th century Zuri Temple, a leisurely 30 minute walk away from the museum. Today you’ll also visit traditional Bhutanese handicraft workshops and the National Library before heading to Thimphu, where you’ll check into the luxurious Amankora Thimphu. Your destination for today is Mendegang, traveling 2 hours along the Dochu La Pass, which offers spectacular mountain views. In Medegang, you will check into a cozy hillside guesthouse for the night, enjoying the serenity of the mountains, authentic local cuisine and the warm hospitality of the locals. 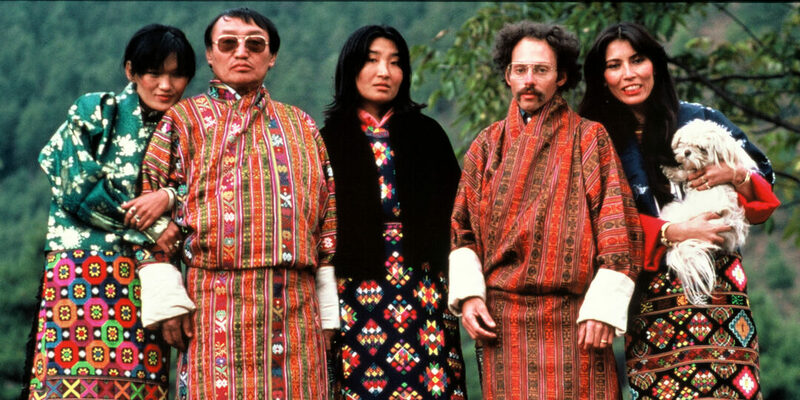 Today, you’ll make your way to Trongsa via Pele La pass. 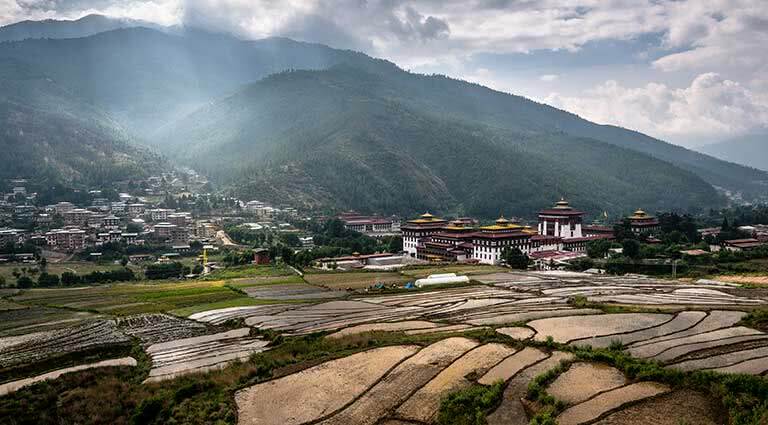 On the way, you will pass through and Wangdue Phodrang town, where you’ll see its beautiful 16th century temple of the same name, a revered Bhutanese site. After that, it’s onward to Chendebji Chorten, around 40 km outside of Trongsa, where you will spend the night at one of the quaintly-decorated resorts such as the Raven Crown Resort or the Yangkhil Resort. Trongsa Ta Dzong is the largest dzong in Bhutan, and you’ll get the chance to explore it today, as well as speak with a local statue sculptor. After that, you’ll move on to Bumthang, one of the most religious Bhutanese sites, surrounded by ancient temples. 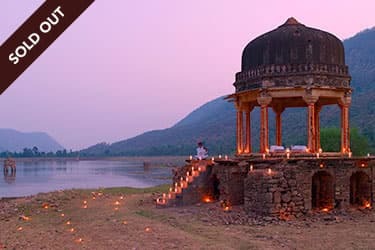 This beautiful area is protected and aside from seeing historic sacred sites, you might even spot the black-necked crane. Bed down in Bumthang for the evening at luxurious Amankora Bumthang. Bumthang is the most historic area of Bhutan and today you have an entire day to explore the valley and its many sacred sites. Hike through woodland, see the Red Panda Brewery, visit Jakar town, see Tamshing Lhukhang, the country’s most important Nyingmapa temple, or Kurjey Monastery, where the first three Bhutanese kings lie. 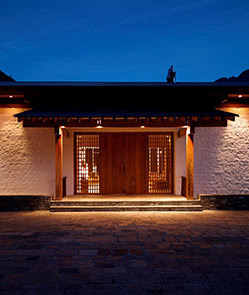 At night, check into your luxurious room at Amankora Bumthang. After visiting the Kurje temple complex, you’ll begin the trekking segment of the itinerary. Your destination today is Ngang Lhakhang, a private Buddhist monastery built in the 16th century, also called Swan Temple. On the way, you’ll pass Thangbi Temple, one of Bumthang’s most historically significant temples. You will spend tonight at a guesthouse next to Ngang Lhakhang. Today you will cross the high-altitude Pepe La Pass at 11,647 feet, marked by a stone chorten and colorful prayer flags. From there, it’s a two- to three-hour descent into Tang Valley, where verdant green fields are home to grazing cattle. Tonight, set up camp at Meadow Camp. Continue your exploration of Tang Valley and witness Ogyen Choling Palace Museum. 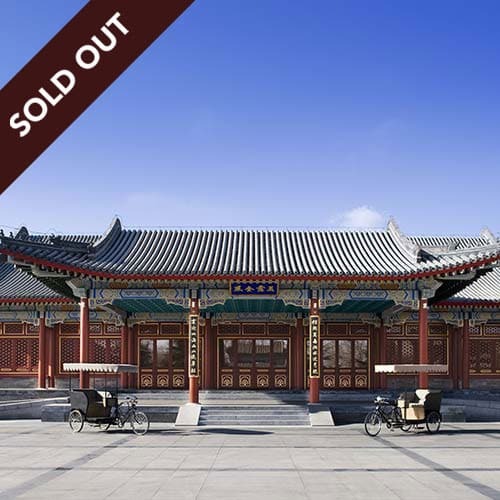 The palace museum features intricately-designed lattice woodwork and stained glass windows, with brightly-colored frescoes and prayers painted on the walls. You’ll spend the night here in this picturesque and friendly mountain village, and have the chance to meet the renowned yatha weavers. Push onwards further down Tang Valley, past Tang Rimochen Temple on the west bank of the river Tang Chu. The revered Guru Ripoche was said to have meditated here, leaving footprints. 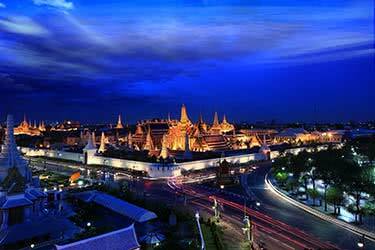 The temple itself was founded in the 14th century and around it, many sacred sites can be found. One of these is the “burning lake” - Membartsho. This is actually a pool in the gorge of the Tang Chu river where Pema Lingpa, a famous Buddhist saint is said to have retrieved sacred treasures. Return to Jakar to retire at Amankora Bumthang. Bumthang and Trongsa are intriguing Bhutanese destinations and today you have the day to explore them independently. The 16th century Trongsa is the ancestral home of the royal family, and here you can go visit the palace, or just go hiking along the Mangdu-Chu river. In the evening, try a traditional Bhutanese hot stone bath at Raven Crown Resort or enjoy views of the Trongsa Dzong from your room in the Yangkhil Resort. Today you head back to Thimphu on one of the final legs of your journey. 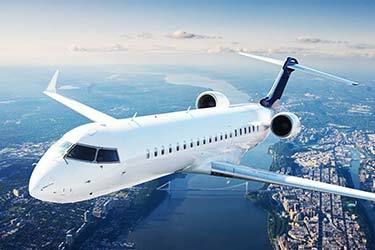 Now’s your chance to spend some leisure time in the capital, whether that’s exploring the city by bicycle, visiting a local orphanage or relaxing in the botanical gardens. Subject to their availability, you can have dinner with a local parliamentarian and hear first-hand the plight of contemporary Bhutan. Check into the luxurious Amankora for your final night in Thimphu. 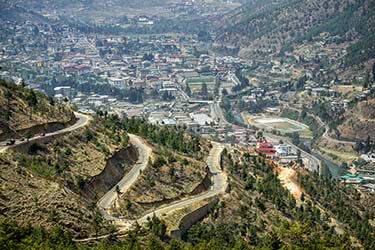 On your final day of your journey, you’ll return to Paro, where you can continue your onwards or stay to enjoy the city’s cultural sites. Paro is home to the “Fortress of the Heap of Jewels” - a temple that houses shrines to various deities. 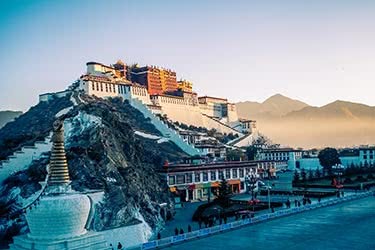 You can also take part in Himalayan singing bowl meditation or revisit the Tiger’s Nest monastery before concluding your tour. 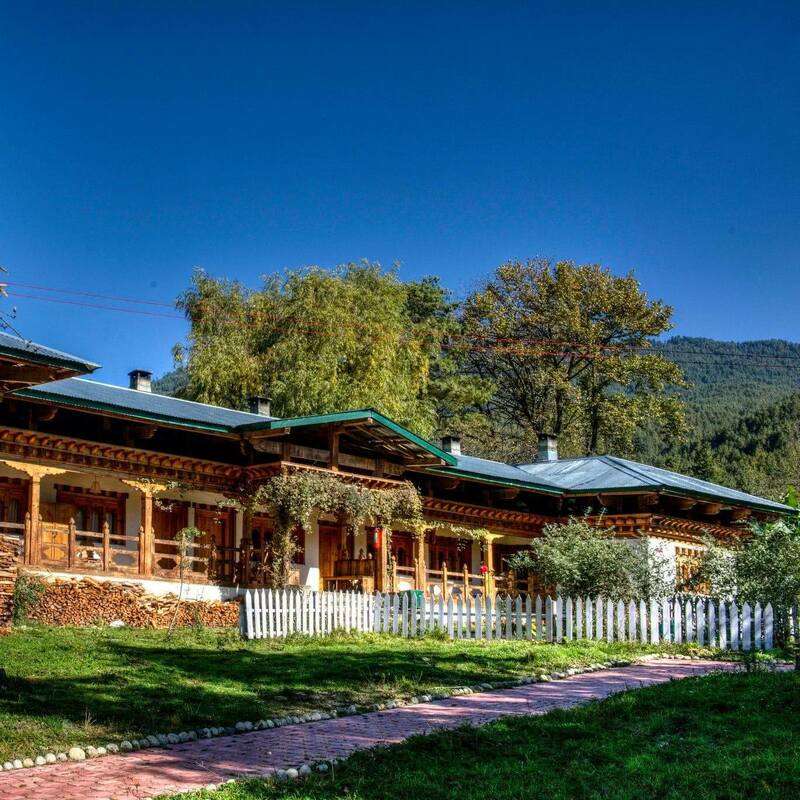 Amankora Paro is located just outside of town and features sweeping views of the Paro valley and snow-capped mountains. 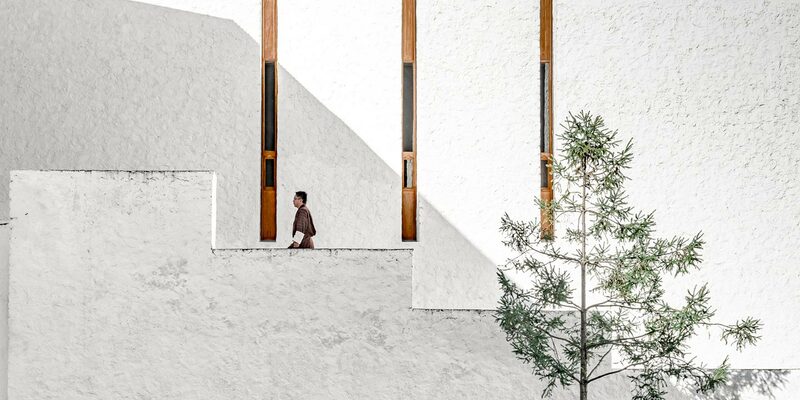 The hotel, just 30 minutes from Paro airport, has 24 spacious suites designed to evoke a contemporary and minimalist vision of traditional Bhutanese style, incorporating local wood, stone and terrazzo tile. 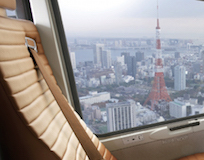 Each suite has a bukhari, or wood-burning stove, and a luxurious bathroom complete with soaking tub. Bhutanese cuisine and international fare are served in the hotel’s great room lounge, dining room, and terrace. The two-level spa contains private areas for massage and treatments, a glass-walled sauna, hot stone baths and a yoga room with a relaxation area. Fax services are available, as is Internet. 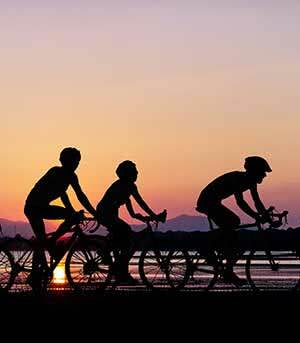 There is no fitness center or pool, but the Amankora’s idyllic surroundings are perfect for hiking and mountain biking. 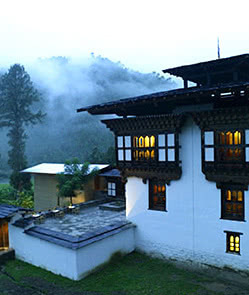 Amankora Thimpu is located on a hillside in a verdant pine forest far above Bhutan’s capital city. 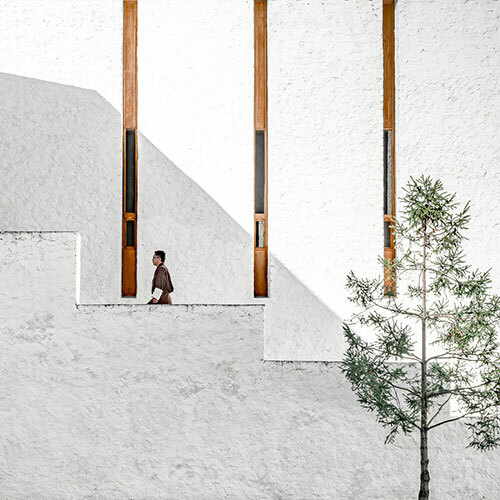 The hotel’s architecture is reminiscent of Bhutanese temples, or dzongs, and incorporates white-washed stone buildings around an enclosed courtyard. Sixteen suites are composed of living and sleeping areas, with views of the forest and nearby streams. The spacious terrazzo-tiled bathrooms have soaking tubs and twin vanities. Guests may dine either in an elegant dining room or on the adjacent terrace, both of which serve Bhutanese and international cuisine. 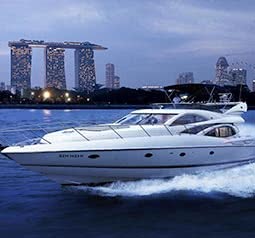 Steam and sauna rooms are available, and massage and spa treatments are offered in private rooms nearby. Traditional hot stone baths can be scheduled. There is no fitness center. Fax and Internet are available. 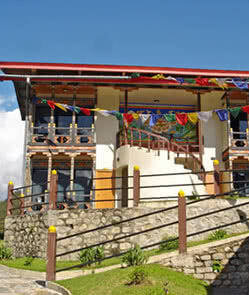 The resort is approximately 30 minutes from the airport in Paro. The three-star boutique Yangkhil Resort is the best in Trongsa and has just 21 rooms, all equipped with full bathroom, central heating and large windows and/or private balconies overlooking Trongsa Dzong, rice fields and small farmhouses. 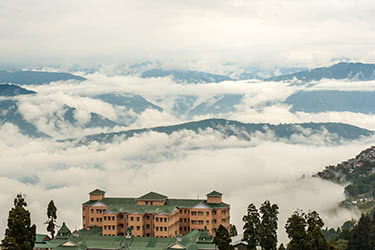 The resort is comprised of a cluster of buildings painted with traditional Bhutanese motifs and built on a hillside. 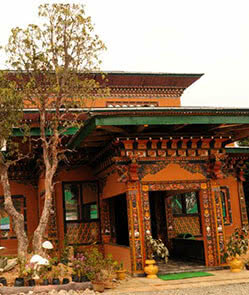 There are three wings of guest rooms and the main building houses the reception area and the restaurant, which serves Indian, Continental and Bhutanese food. Other amenities include a business center with Internet access, a bar and laundry service. Raven Crown Resort stands in a mountainous area on the outskirts of Trongsa Town. The hotel overlooks the entire Trongsa valley including the Trongsa Dzong and the Ta-Dzong. Surrounded by nature, rhododendron and oak trees, the hotel has a calm and peaceful atmosphere inside and out. There are just 37 guestrooms that seamlessly blend traditional and modern Bhutanese architecture, inside the décor combines classic elegance with Bhutanese artwork. The rooms are built using local materials such as mud, stone and timber, they have plenty of natural light and are insulated with double paneled glass windows. The en-suite bathrooms feature rain showers and under floor heating, hot water is supplied by solar water heaters installed on the roofs. The room amenities include a balcony, custom made furniture, LCD TV, Wi-Fi, mini bar, customized stationary, iron and ironing board, wall mounted heaters, tea pot and mugs, bath slippers, bath robes, bath utility set and drinking water. 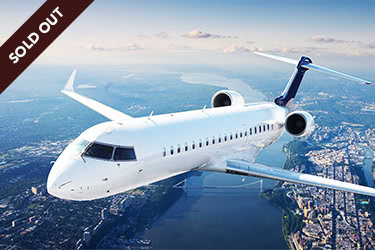 The resort facilities comprise a restaurant and bar, conference room, business lounge, VIP dining room, shop, swimming pool, gym, Jacuzzi, steam room, infinity pool, Internet café, a folk museum and a coffee shop. 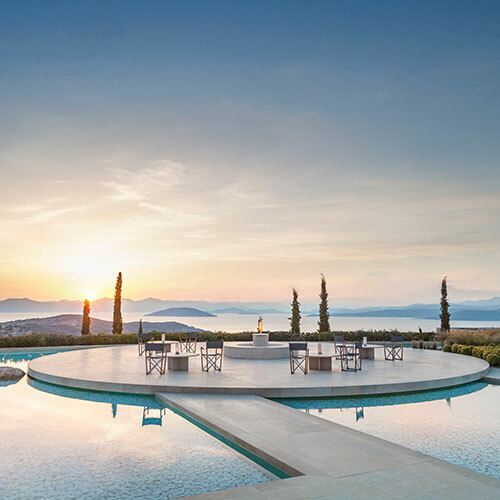 The resort even has its own open-air amphitheater and a helipad. At the in-house spa guests can be treated to a traditional Bhutanese hot stone bath and a range of therapies and treatments using local herbs and massage techniques. 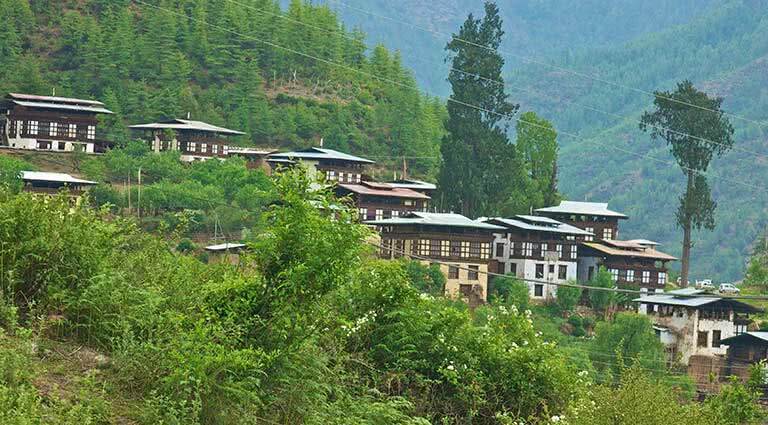 Amankora Bumthang is a recently opened Amankora in Bhutan, with views of buckwheat, millet and potato fields, an apple orchard, and Wangdicholing Palace, the Kingdom’s oldest palace, which is now a monastery. 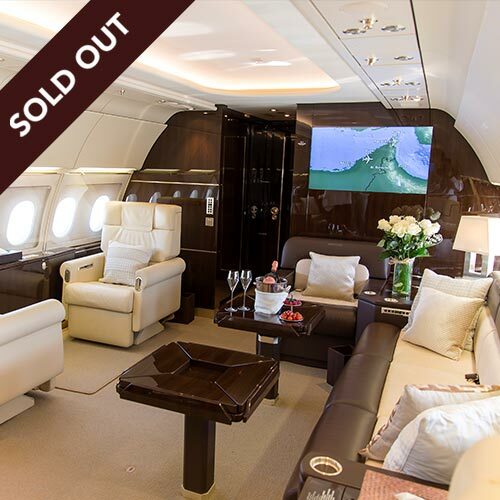 There are 16 suites complete with a bukhari and views of the courtyard and palace. 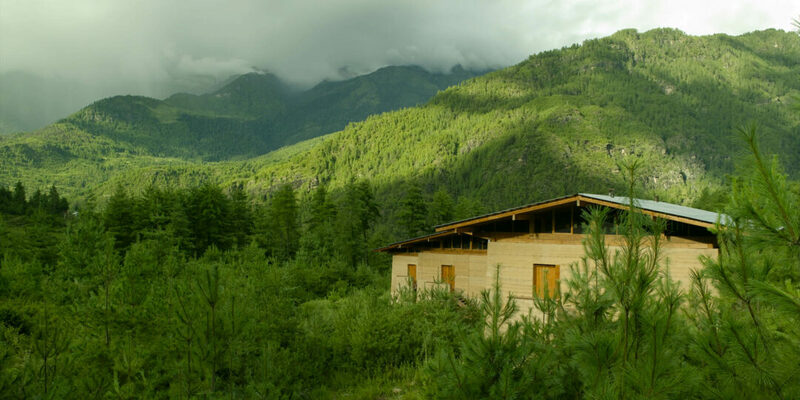 Amankora Bumthang has a spa with three treatment rooms and a steam room. There is no business center, but the Library has an Internet station and WiFi access. 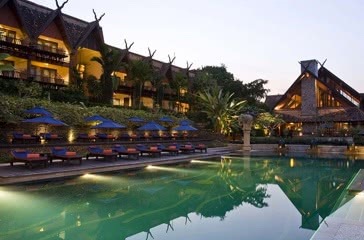 The resort is approximately nine hours from the airport in Paro. In order to pursue a full immersion into the majesty of Himalayan culture and its sweeping, dynamic landscapes, one must venture away from the beaten path. 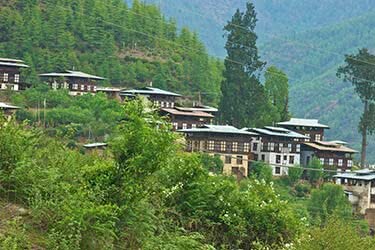 Home to several remote guesthouses scattered amidst the country’s most rural corners, Bhutan offers ample opportunity for accommodation perfectly suited for travelers seeking to escape into untouched territory. 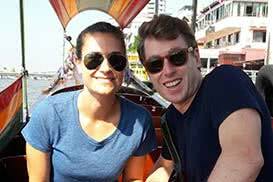 Experience the authentic rustic lifestyle and warm hospitality of the locals. 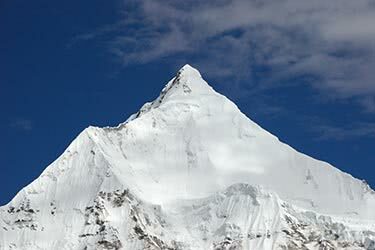 Enjoy close commune with nature by setting up camp in the great outdoors as part of a Bhutanese Himalayan trek. 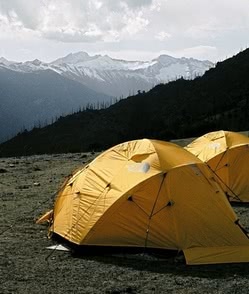 Surrounded by forests, travelers fall asleep under the stars and wake up to glorious mountain views each morning – campsites really allow travelers to connect with their environment and enjoy the serenity of the Himalayas. 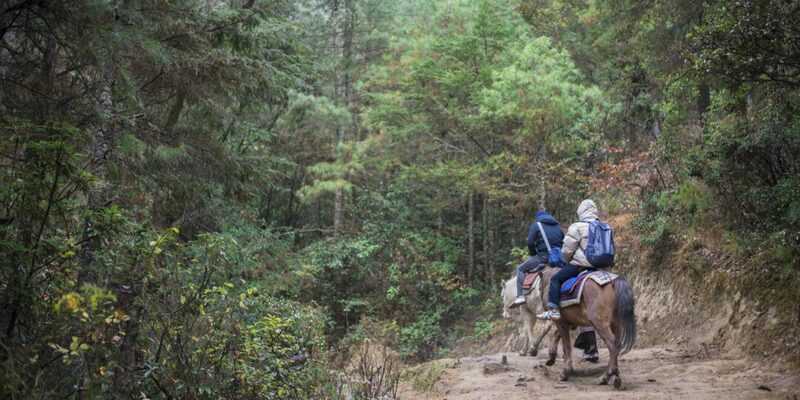 Accompanied by guides and horses or yaks transporting camping equipment, you will stay at established campsites with all food and drinks provided, with meals prepared by an experienced chef. In some places around Bhutan, our recommended camps share sites with yak herders, giving travelers the chance to learn about this traditional semi-nomadic lifestyle first-hand. 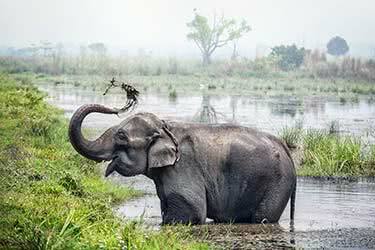 Camping in the oak forests, peaks and valleys of Bhutan also puts campers in close contact with a diverse array of wildlife, including the chital, deer, langur, and different species of Northeast Himalayan birdlife. 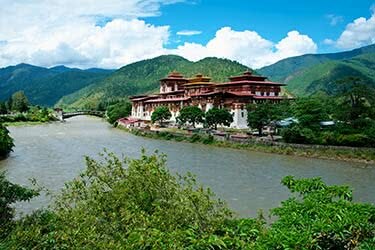 Enjoy a classic tour of Bhutan’s beautiful countryside on this 14-day journey from Paro to Thimpu. 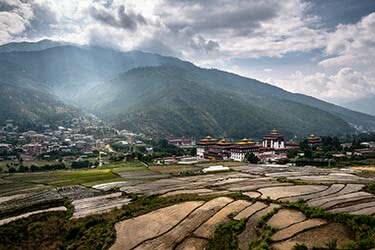 You’ll visit such time-honored spots as Drukgyel Dzong, Tiger’s Nest Monastery, and Gangtey Monastery, step into the lush Tang Valley, all while staying in luxurious Amankora hotels dotted across the country. 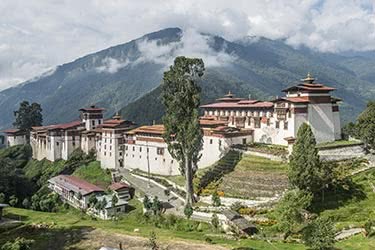 Take a ride on the open road through Bhutan’s stunning countryside, as you’re chauffeured from Paro to Thimpu in your luxury vehicle. You’ll marvel at religious sites like Rimpung Dzong and Drukgyel Dzong, interact with local families at their farms, and enjoy luxury stays at luxurious Amankora hotels. 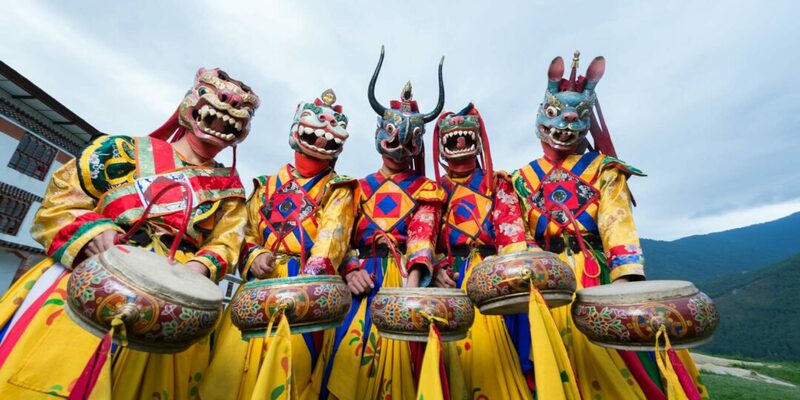 Experience a whirlwind 6-day adventure through Bhutan’s rugged terrain. You’ll take in the natural beauty of Paro Valley and Simkota Lake, while you marvel at the ancient Tiger’s Nest Monastery, see the takin at an animal preserve, and sleep at the luxe Amankora, on this incredible journey. 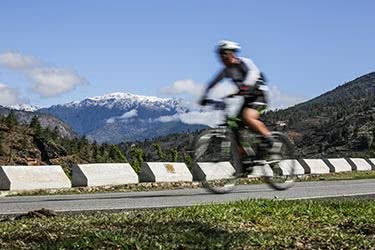 Take in Bhutan’s lush landscape on this 16-day luxury bicycle adventure, pedalling past ancient Buddhist temples like the Taktsang Monastery, climbing Bhutan’s highest road pass, Thrumsing La, and gaining insight into local religion at a Buddhist festival in Jakar, while staying in luxe hotels like Uma by COMO. 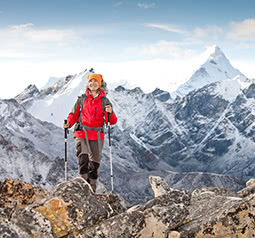 Reap the rewards of challenging yourself to this incredible 13-day trek through Bhutan’s majestic mountains. You’ll hike and camp in breathtaking spots like the base camp of Mount Chomolhari, visit historic landmarks in Paro like the Kyichu Lhakhang Temple, and stay in luxury at the Amankora or Uma by COMO. 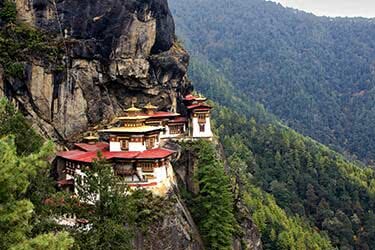 Experience the natural beauty of Bhutan on this exciting 12-day trek through some of the country’s most picturesque scenery. You’ll step into the past at the ancient Kyichu Lhakhang Temple, explore the Kuri Chhu river on foot, and make a pilgrimage to Singye Dzong, while staying at luxury hotels like the Amankora. 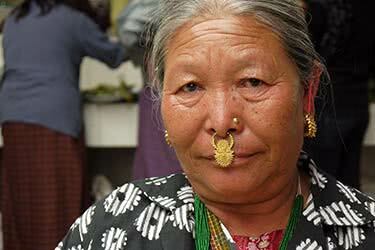 Our General Manager Victoria Hilley visits Bhutan for its spiritual depth and beauty. 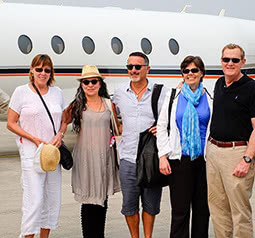 Yaks, golf, cham dances, and traditional garb – veteran writers and photographers Nazima and Earl Kowall share their unique Bhutan experiences. With Aman destinations at Paro and Thimphu, this trek through Bhutan's Druk path has luxury at the start and the finish. 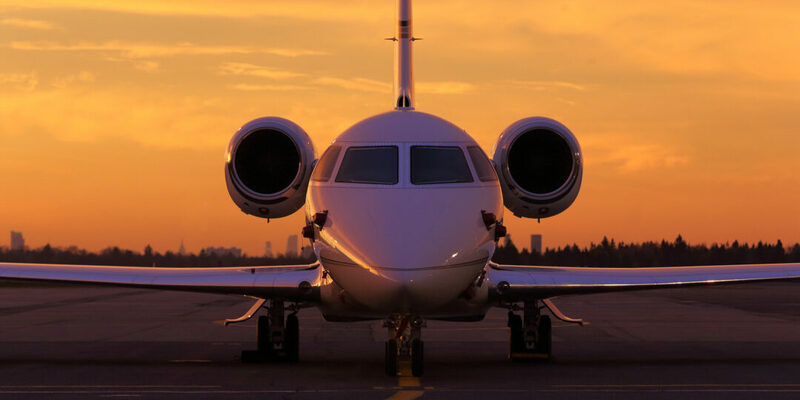 “This extraordinary voyage will incorporate nine unique destinations,” Roland Fasel says of 2018's exclusive Aman Global Private Jet Expedition – a journey that stretches from Tokyo to Venice. 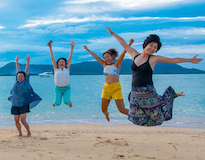 Swap the resort’s kids club for a foray into a totally distinct culture and you are looking at a very different family holiday, one that is filled with adventure and enriching, horizon-broadening experiences. 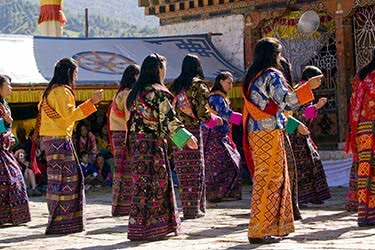 Today we’re whisking you off on a journey into the pretty towns and mountainous meadows of beautiful Bhutan for a glimpse of its fascinating summertime traditions.